“Franke James’ presentation at Georgetown University resonated with me because of Franke’s resilience in the face of a situation many would step away from. Instead of being bullied into silence she spoke out as many of us should when our governments are not acting in the interests of their people. Not only did she speak out for herself but in doing so speaks out for many of the activists, youth, and scientists engaged in the struggle to preserve our planet by stopping the expansion of Alberta tar sands. I learned a great deal about the political situation in Canada, something we may not think about often, even though they are our neighbor to the North. If more people knew about Franke’s story, they would pay a lot more attention to Canada and Prime Minister Harper. Do Not Talk about Climate Change? Franke James speaks up for the climate and against censorship! Canadian author, artist and environmental activist, Franke James, is bringing her ‘Oh No Canada’ anti-tar sands art show to the streets of DC. James is coming to Georgetown University on October 9th for an entertaining talk on personal activism. Hear her tell her true-life story about being censored by the Canadian government – and how she is fighting back using social media, crowdfunding and the power of her activist art. At a time when Canada’s Prime Minister Stephen Harper is urging President Obama to approve the Keystone XL tar sands pipeline, artist Franke James highlights the Government of Canada’s own deplorable record on climate change and its attempts to stop Canadians from talking about climate change and the dirty tar sands. Event: Do Not Talk about Climate Change? 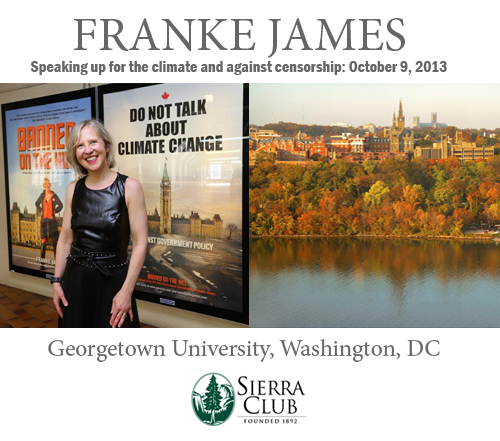 Franke James speaks up for the climate and against censorship!